YUMMY NEPALI KITCHEN, Making Sweet Food "JALEBI"
Today I am going to show you how to make Jalebi. Jalebi is also called Jeri in Nepal. Take a flour in a bowl. Curd and a pinch of Turmeric on it. Mix it well. Then add some water. And mix it with a balloon whisk. You can also mix it with the help of spoon. But mixing it with a balloon whisk is easier. 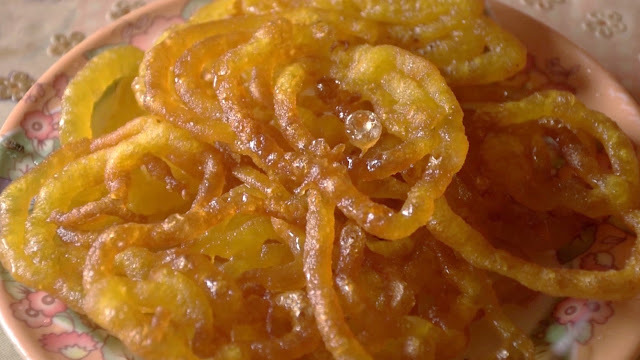 If you make this paste and put it for whole night and make the Jalebi tomorrow then this this Jalebi is easier to make and Jalebi is also made properly. And if the Jalebi made in hurry, Then put the paste for at least for 2 hours. I put the mixture for 2-3 hours. Since Jalebi is a very sugary dish, I will show you how to make chasni for Jalebi. Take a bowl of sugar and put it in a big sized bowl. Then take same amount of water as you took sugar in the bowl and add it in the sugar itself. Then heat the equal amount of sugar and water and heat in the gas. For chasni it is heated for long time. You can know that the chasni is made well if it is sticky in hand. Now take the paste which you kept for 2-3 hrs. Then take a clean plastic of half kilo. And put the paste in the plastic and tighten it with a rubber band. Now heat a pan. Add some sufficient amount of oil to drain the Jalebi’s mixture. Then the plastic is cut from one end. Then slowly pour the mixture on a ring shaped a shown in video. You can turn it another side with the help of tongs. Jalebi is well cooked when it is red in color. Then take the Jalebi out with the help of tongs and put it on chasni only for 2-3 second and take it out and put it on another plate.